The all-new 2014 Subaru Forester has received another North American award as the "Best Car to Buy" from automotive publisher High Gear Media. The new-generation 2014 Subaru Forester keeps piling up awards, but is it really the best car to buy? 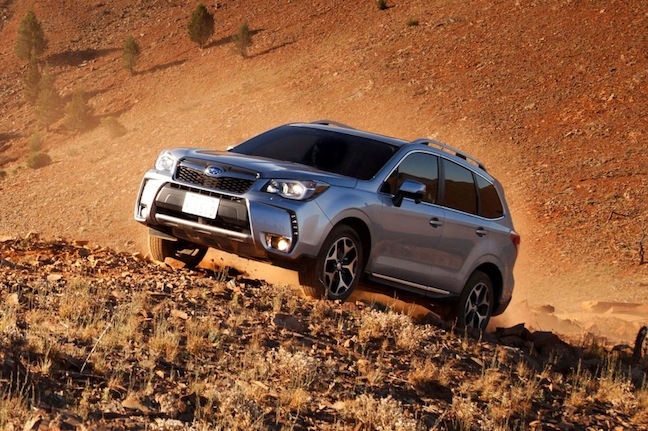 Forester has won its second major North American award in weeks, being named “Best Car to Buy 2014” by automotive publisher Car Connection. The fourth-generation Forester seems to be blowing away a good field of competitors and getting much attention from the media. But is the small SUV really that good? Forester beat a field of 15 nominees in the awards, which were judged by expert editors from High Gear Media's car shopping and automotive news websites, The Car Connection, Motor Authority and Green Car Reports. High Gear Media’s editors use a unique “TCCRating” system to judge the cars. It uses a clear numeric rating value based on a 10-point scale that reflects the overall opinion of the automotive experts on any vehicle. HGM’s TCC Rating rolls up scores given to each vehicle across sub-categories including safety, comfort and utility, fuel economy, performance, and styling. They concluded that the new 2014 Forester was by far the best car to buy for 2014. And it beat an impressive field of new cars to take hone the award from HGM. “The 2014 Subaru Forester is, hands down, the most versatile vehicle we drove this year. It doesn’t skip any steps in winning us over - and that includes performance,” according to Marty Padgett, editorial director of High Gear Media. The 2014 Subaru Forester is the first vehicle ever to ace every aspect of the challenging small overlap front crash test conducted by the IIHS. This makes the Forester one of the safest SUV’s on the planet. It helped the new SUV to be awarded a Top Safety Pick+ (TSP+) award from the Insurance Institute for Highway Safety (IIHS). High Gear Media isn’t the only North American media outlet to be impressed with the Forester. Last month, Forester was named MOTOR TREND magazine’s 2014 Sport/Utility of the Year. The U.S. specification Forester previously won the award in 2009 and Outback in 2010, making Subaru the only brand to have won the award three times. Just last week we reported here that Subaru Forester underwent testing by five professional driving instructors from the United State Emergency Vehicle Operations Center. The Foresters Symmetrical all-wheel-drive system with X Mode was tested against Ford Escape, Toyota RAV4, Mazda CX5 and Honda CRV and it topped the list of competitors. Is the new generation 2014 Subaru Forester really the best new car to buy? It’s hard to argue with the Foresters long list of awards and accomplishments. But the answer lies in buyers who are snatching up the new SUV in record numbers. October sales for the new 2014 Forester increased 137 percent, reaching 12,581 vehicles sold. And Forester sales were up 56.7 percent since the beginning of the year. Buyers are saying the new 2014 Forester really is the best new car to buy.